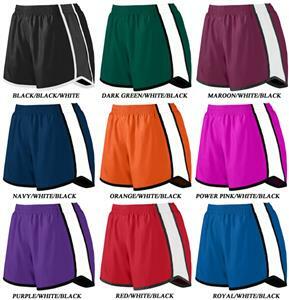 Augusta Sportswear Girls' Pulse Team Shorts. Shell is 100% polyester micropoly. Inserts are 100% polyester mesh. Lining is 100% polyester wicking crepe. Liner wicks moisture away from the body. Junior fit. Low rise. Covered elastic waistband with inside drawcord. Inner brief with leg elastic. Inside key pocket. Mesh inserts on panel. Waist (on half) 11 1/2" 12 1/2" 13 1/2"
Hip (on half) 16 1/2" 17 1/2" 19 1/2"
Inseam 3" 3 1/2" 4"